I spent a recent Saturday morning at the local organic market. Unfortunately, it was the Saturday after New Year’s and my favorite local producer wasn’t there. “It’s France, aren’t all the market people local producers?” you ask. Well, you would like to think so. It’s romantic to envision all the Ile-de-France farmers descending upon Paris to sell their goods, a basket of local produce only a market away for the food lover. But, the reality is that many of the markets are filled with distributors as opposed to producers, which makes it easy to get mangoes and pineapple in January in Paris and yet more of an effort to track down a locally grown potato. I exaggerate to make my point, but there’s an element of truth in it. There are local producers, and at my Saturday market there is a delightful lady at the Au Val du Coûtant stand. But, alas, since it was the weekend after the holidays, she was still on her holidays. Not uncommon for the more independent producers, and considering they spend most of the rest of the year working very hard, it’s nice to seem them check out for a bit. Galette man wasn’t there either. And, neither was Hermione and her kale (my balcony kale thanks to Kale Project seeds only produces so much). When your three favorite stands at the market are nowhere to be found, you begin to panic. Committed to the “buy as local as possible plan,” I walked up and down the rows scanning to find a “notre production” sign. And, I did. You could immediately tell which ones were the vegetables recently pulled out of the ground and very much the stand’s own production. Mishapen carrots and potatoes covered in dirt, a basket of freshly grown herbs with a few roots dangling here and there, and a huge basket of a bright orange potiron sliced into enormous wedges. I always have trouble trouble with the potiron translation. Look it up and you’ll find that it means pumpkin. But it’s not the typical pumpkins that we think of in the US, probably we’re just used to one variety of pumpkin. And, the taste of this potiron is slightly like pumpkin, and bright orange as well, but veers much more in the winter squash direction. Whatever it is it’s a winter squash and it’s delicious. That huge wedge has made its way into every single dinner meal this week, which is what I call a good vegetable investment. 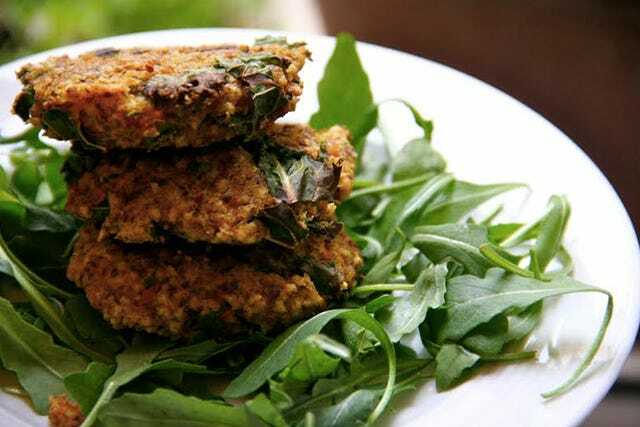 And when I sauteed a little too much, I combined the softened cubes with some leftover millet and turned them into patties. Now granted, this is usually a recipe I make with leftovers. A little millet and then a little whatever else you need to use up. Which means the variations are endless (and I have included a few below). The key is to cooking your millet so that it’s fairly wet and sticks together; you want it more like porridge and not light and fluffy like couscous. And, not to worry, in the end, I did find kale at the market, and it just happened to be that very stand’s own production. In a saucepan, “toast” the millet over medium high heat about five minutes, until you get a nutty smell and the millet is golden brown. Add in the water and salt and bring to a boil. Cover, reduce to a simmer and let cook for about 10 minutes or until the millet has absorbed most of the water. Remove from heat and let sit covered for 15 minutes. 1. While the millet is cooking, saute the saute squash and garlic in a few tablespoons of olive oil, until the squash is soft enough that you can mash it with a fork. This will depend on how small you cubed the squash, but saute for about 10 to 15 minutes. 2. Preheat the oven to 400°F (200°C). Place the squash, millet, flaxseeds, and kale in a mixing bowl and stir together with a fork, mashing down the squash cubes as you stir. 3. 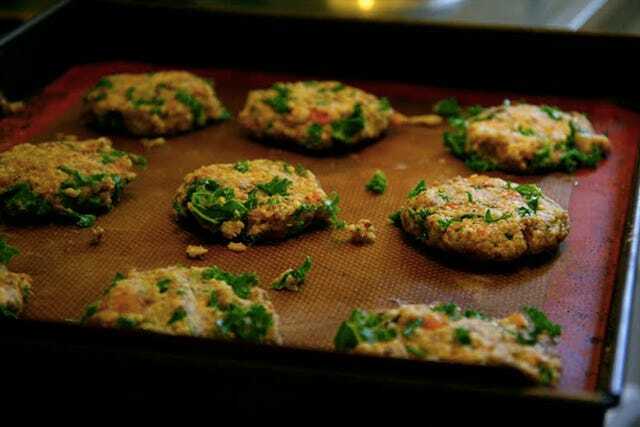 Using your hands or a large spoon, form into patties (make sure the batter has cooled enough so you can touch it!) and place on a baking sheet. You can use a silicone baking mat or grease the pan with a little olive oil. 4. Bake at 400°F (200°C) for 20 minutes, flipping the patties after 10 minutes. 5. Remove from heat and serve immediately. You can also place these in the refrigerator and heat up later. Want more spice? Try adding a little cumin. Replace the kale with about 1/3 cup chopped cilantro. Add in chopped hazelnuts or raw sunflower seeds. Mix in a bit of goat cheese.